Asterix & Obelix finally go desi! THIS might just be the hottest piece of news in Indian publishing in recent times. Asterix, the French comic classic that boasts of having sold an unmatched 370 million copies in more than 100 languages, is now available for Hindi readers — after five years of painstaking translation. Published by Om Books International, the ‘albums’, as they are called, were co-translated by Dipa Chaudhuri and Puneet Gupta, who took close to 6-8 months to translate each album. The task was ‘not merely a word-to-word translation’, said the duo in an email interaction. How did you decide on the Asterix series for a long-term translation project? Which other series did you consider, and which ones do you intend to follow up on, for your next project, going ahead from here? Dipa Chaudhuri: Ajay Mago, Publisher, Om Books International, acquired the Hindi translation rights of The Adventures of Asterix from Hachette Livres, France, after nearly five years of sustained negotiations that started in 2009, with a blind call at an international book fair. Ajay just walked into the Hachette Livres stand, hoping to get the Hindi rights for Asterix, a rather logical step after having recently acquired the Hindi translation rights for The Adventures of Tintin from Editions Casterman. Once the rights were finally acquired in 2014, Hachette Livres indicated to Ajay that the comics were to be translated from French to Hindi. The comics were co-translated by me — I have an MPhil in French Literature from Université Paris Diderot-Paris 7, and I’ve been a publishing professional for nearly two decades. Since 2010, I’ve been Chief Editor, Om Books International, and I look after the fiction and non-fiction publishing lists, while Puneet is an advertising professional and a producer of audio visuals, who writes science fiction novels, short stories and humorous poetry in Hindi. A die-hard comics enthusiast since childhood, he has translated the comic series Tintin in Hindi, also published by Om Books International. Given the number of comics in the Asterix ‘canon’, and in the entire series, it was clear that we were in it for the long haul. At the moment, the first four albums are out. Completing the series would take, at the very least, another couple of years. How difficult, and enjoyable, was the experience — especially to do with the word play, the puns and the humour from the original text? Did you ever fear that some of the funny elements might get lost in translation? Puneet Gupta: It was a very interesting process. As the word play became more complex, finding suitable translations became more challenging. We worked through various options till we stumbled upon that elusive one which worked well, and that epiphany mattered to us. The series is replete with intricate word play, sometimes running through a series of dialogue, and on occasion, through several pages. 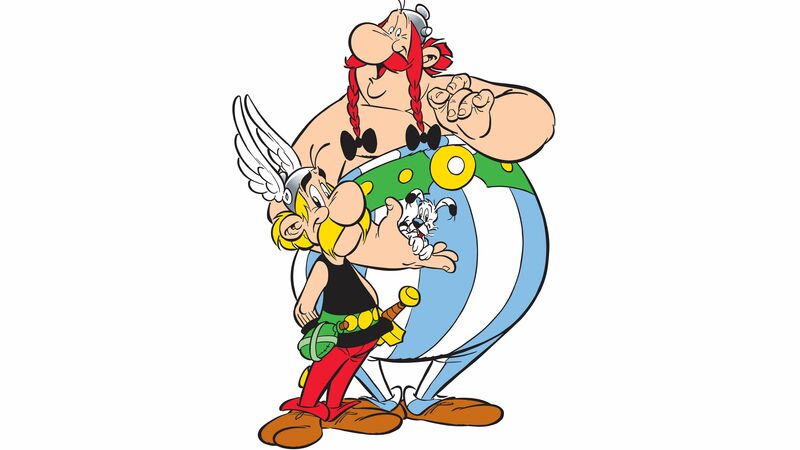 In a particular instance in Gaulwasi Asterix, the Camp Commander Caius Bonus (Ati Atmavishwasus) approaches Asterix and Druid Panoramix (Ojha Aushadhiks), for a cure for non-stop hair growth that afflicts the camp, after its inmates drink the Ojha’s ‘magic potion’. The whole camp is tricked by the druid into believing they were drinking the magic potion for super-human strength. As Ati Atmavishwasus pleads, frets and fumes haplessly with his unruly and knotted beard flowing to the ground, Asterix cracks pun after pun on hair, over nine panels across two pages. There are references in French that would be unknown to a Hindi reader, involving differences in popular jokes, in cultural and linguistic constructs. Thus, we looked for parallel proverbs, popular jokes and clever turns of phrases to convey the same punch and humour as in the original. A sense of humour and wit helped us come up with such solutions. The risk of the wit and humour of the original being lost in translation is always a possibility, but so far, we have been able to come up with convincing equivalents. The Asterix series has a great combination of slapstick and literary humour as well. How was it as a translator to be balancing out these aspects, and still retaining relevance to the original illustrations? PG: Being a comic series with a very significant graphic element, the largely visual slapstick humour is conveyed efficiently through the excellently drawn panels. Whether it’s our Gaul heroes settling scores with an adversary, with only his teeth or sandals in the speech bubble to speak for the devastating aftermath of the encounter, or the effect Besurtalix's singing has on everyone, a handful of translated sound effects in the panels suffice to convey the drama and humour. Literary humour is rather difficult to translate. Fortunately, with the vast body of work in Hindi words, jokes, proverbs, songs, rhymes, poems, riddles and a rich repository of popular lore to dive into — we do end up finding equivalences that do justice to and retain the wit, satire, humour and punch of the original text. Tell us about the role played by the French Embassy for making this project a success. How do you hope that French heritage and culture will gain significance through the adventures of Asterix in Hindi? This is especially given recent history concerning religiously sensitive material in the comics format in Europe. DC: This translation project has been partly sponsored by the PAP Tagore Programme in Paris, and locally by the Institut Francais en Inde. Having said that, post-colonial India and Indians have already been exposed to a plethora of world literature, including comics. We have grown up reading Superman, Phantom, Mandrake, Modesty Blaise, Archie comics, Tintin and Asterix alongside Chacha Chaudhry and Deewana (our homegrown version of good old Alfred E Neuman), RK Laxman and more. Our colonial heritage, now a part of our socio-cultural DNA, is paradoxically a bane and a boon. We do not resist either reading, writing or speaking in the language, supposedly of the ‘others’ that over time have been embraced as a personalised mode of expression by the ‘I’. Therefore, while Asterix comics constitute a significant part of French culture and heritage (set in 50 BCE, please) the Indian market today is flooded with French perfumes, fashions, bags, wines, films, art, culture, and what have you, without many consumers even being aware of Asterix as a promoter of French culture and heritage. Is the humour in Asterix in consonance with the underpinnings on which the edifice of humour per se reposes? Pretty much yes, so the humour at its most irreverent, whether anti-establishment or otherwise, feeds off cultural and ideological superiority, racial, ethnic and linguistic slurs, gender stereotyping and other devastating premises that go beyond the pale of politically correctness. But most of us play along since there is an unspoken pact between the participants and interlocutors that it is all in jest and good cheer. What were the most challenging segments, and portions for you, over the course of a five-year-long project? Were there any major creative hurdles that you faced, and how did you overcome the challenges? DC: Translating comics have practical constraints. The first and immediate constraint is fitting the Hindi translation from French into each speech bubble, despite Hindi being syntactically longer than French, also because of the maatras on the top, bottom and the side (in French, the accents are only on the top). While the French comics are handwritten, we had to look for a similar font in Hindi that could be typed out on the keyboard. At times, we needed to choose different fonts that would establish the distinct accent with which a Goth would speak, for instance. (In the English translation, the Gothic font was used for the Goths). Besides the fonts, we had to ensure that each linguistic community spoke with the accents phonetically associated with it. So the Goths took on harsh and guttural sounds in Hindi. The accent was also a challenge when we were translating the speech of a drunken sod. Besides slurred speech, words altered forms constantly through a series of dialogue to indicate a constantly altered perception of reality as is wont to happen when one is sloshed. Apart from Asterix and Obelix, the various gods and goddesses, and historical figure like Julius Caesar or Vercingetorix, whose names remain unchanged, renaming the characters, designations, geographical coordinates was an exciting exercise as each name in French and in Hindi has multiple meanings. Each language has a set of distinct sounds or onomatopoeia, that replicates gestures and actions. We had to work our way through the sounds from French in Hindi too, and already have a sound directory of over 100 onomatopoeic sounds. For pure visual effect, more so after a vigorous exchange of fisticuffs, sounds in Hindi had to be drawn and manually fitted into many frames without speech bubbles. Soon, we realised we were translating not only from French into Hindi, but depending on the provenance of the protagonist, we were translating from Latin, and on occasion, German too. This shall only get more complicated as Asterix and Obelix travel out to Britain, Egypt, Corsica, Spain, India, and more for the distorted nuances in French are most likely to be borrowed heavily from the languages spoken in these places. So, before translating the nuances into Hindi, we shall have to go into the etymology of the words, and the origins of the phrases. Negotiating between different registers of each language to establish the social hierarchy within which the characters were situated, was clearly a part of the task at hand. The series is replete with French songs, nursery rhymes, etc that have first been distorted in the French version itself and posed the twin challenge of first getting to the originals and then translating these into Hindi with as many layers of meanings carried forward. The idea was never to ‘convert’ the comics by translating them into Hindi just as competent translations of the French, Italian and Russian literary masterpieces into English or other languages were meant to ‘communicate’ the narratives instead of ‘converting’ or ‘customising’ them to the cultural construct of the language these were translated into. Also, the imposing visuals of Asterix would make it near impossible to ‘Indianise’ the comics. The comics are being translated with the desire to share a cultural experience that is quite unique, different, yet not dissimilar in the gamut of human experiences. How did you deal with the character names, what with all the funny prefixes and suffixes? And also, the Roman military salutations — take us through the deliberations you had about translating these aspects. PG: We had to decide on a few guidelines that would be followed in the course of translating the entire series. These included the set of names of the central characters, the Roman garrisons surrounding the village of the Gauls, the various ethnic groups — the Romans, the Germans, the British or the Egyptians, to name a few, all identified with a unique suffix as given to them in the original text. Apart from the actual historical figures such as Vercingetorix, Julius Caesar, Brutus, Cleopatra, etc, all the other character names are puns and mini-jokes in themselves. In Sone ki Darati, there is a shifty dealer named Lentix, who we translated as Dal-me-kalix. In Gaulwasi Asterix, Caligula Minus, a diminutive Roman legionary, is forced to volunteer to infiltrate the village of the Gauls, masquerading as a Gaul, to try and learn the secret of their magic potion. The name itself is a satire on Emperor Caligula and Minus meaning small, a runt or a loser. He is from Lutetia, the predecessor of Paris. So, we named him Lutiya Dubus, a spin-off from a popular Hindi proverb ‘lutiya dubona’ meaning to end up a loser. Barbaric Germans tribes have funny sounding names, ending with a suffix ‘ic’ —Teleferic, Metric, Theoric, Periferic, Choleric, and Histeric. According to their mental make-up, we renamed them Atyacharik, Maardhadik, Becharik, Bimarik, and Mahamarik. The suffixes particular to linguistic and cultural communities were retained as in the original. We have also tried to retain the original flavour of many names. The first Roman camp is called Aquarium and we named it Jhakmaaram, after the popular Hindi phrase ‘Jhak Maarna’, meaning catching (killing) fish, implying being idle with not much else to do. The dog, Idefix, or of fixed ideas, was renamed Adiyalix, someone who is doggedly obstinate, and loyal too. Druid Panoramix has become Ojha Aushadhiks. The village of the Gauls, is almost tribal in nature, and the druid is a combination of a medicine man and a witchdoctor, who brews potions with magical powers. Another character Cetautomatix, has been named Svachalit Loharix. The military terminology was interesting too. The Romans salute their superiors with ‘Ave’, which we translated as ‘Jai ho’. Ranks such as Centurion and Decurion had to be suitably translated as well. So after much deliberation over the existing ranks in the Indian military, we preferred coining ranks like ‘Dashpati’ for Decurion (a commander of 10 soldiers) and ‘Shatpati’ for Centurion (commander of 100 soldiers) that would actually do justice to the original terms rather than Major or Colonel, etc. 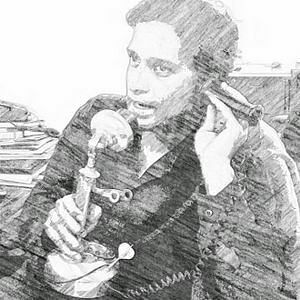 Could you share any insider jokes — funny incidents that a Hindi reader will enjoy, and laugh at? What manner of cultural insights did this project give you, at a personal level — to bridge differences between countries, and make the best of language for all? How does this make us more human? PG: Translating Asterix from French has been a revelation, and helped understand cultural nuances better. One of the most difficult parts we had to translate was a complex riddle in the fourth album, Talwarbaaz Asterix. For ease of comprehension, we quote the English translation, ‘My first is a hundred, my second is a sign of the zodiac, my third is a Hibernian, my fourth is the Egyptian God of the Sun and Julius Caesar loves my whole. Who am I?’ The answer is: C, Leo, Pat, Ra — Cleopatra. There was no way we could break up ‘Cleopatra’ in the Devanagri script into syllables to come up with a riddle, because none of the syllables would make sense. We thought of using popular riddles, but those had nothing to do with the 50 BC timeframe and the Romans. Finally, we settled for a popular riddle; in Hindi, it goes somewhat like, ‘Sar hai mera kadahi me, dhad hai maar-kutai me, pair gagan ki oonchai me, poora badan ladai me, bolo bolo main hoon kaun?’ This was closer to the visual cues too. For the answer, you have to read the Hindi album, Asterix Talwarbaaz. Is there a point to make here about the emotional content in Asterix adventures? What’s the bottomline sentiment that drives you to complete one Asterix adventure, before moving on to translate another one? PG: The idea of embarking on a new narrative in each comic with its fresh round of challenges is interesting for the simple reason that like all great classics, one is forever discovering something new each time we look at a dialogue or frame, and for the joy of decoding the wordplay, the cultural ciphers, and hopefully learning a bit of the art by unravelling the code. We all would have picked up similar linguistic and cultural subversions from the body of James Joyce’s works too. Do you have any personal favourites among the characters from the Asterix world? DC: Ojha Aushadhix, the venerable village elder, for occasionally exercising restraint yet reinforcing the notion of Gaul supremacy and invincibility through the magic potion he brews. Besurtalix, for relaying the myth of Sisyphus and not hesitating to start at ground zero each time he is gagged for singing badly. He is a true survivor. Obelix for being an important component of this ‘mice and men’ combine. 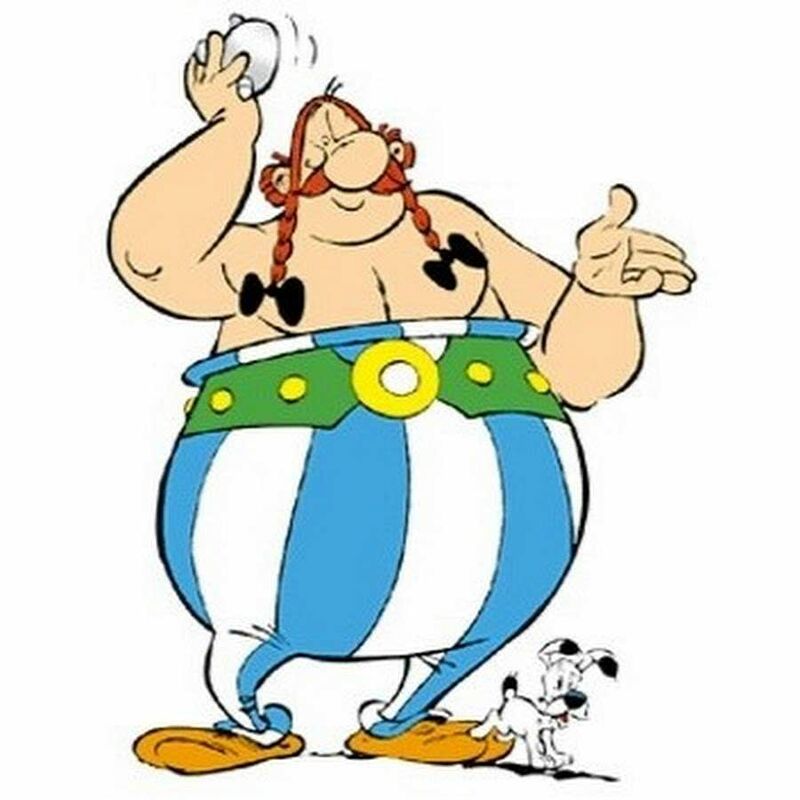 Asterix for his wit and bravado, despite the distorted nationalism. Did you ever go back home dreaming about being transported back to the time of the Gauls? How has this entire exercise affected you at a personal level? DC: We live in an amalgamation of historical eras contemporaneously, and also, an amalgamation of global experiences. At times, one wonders whether the world has really moved beyond 50 BC. Having said that, what stays with us is the great art of writing comics that are important alternative histories that also deride and question such histories. Asterix is, at the end of the day, a great body of satire. We’re well aware of the global popularity of Asterix — being translated in over 100 languages, in animated and live action films, video games and theme parks. Are there any plans to extend the Hindi initiative into other entertainment streams? 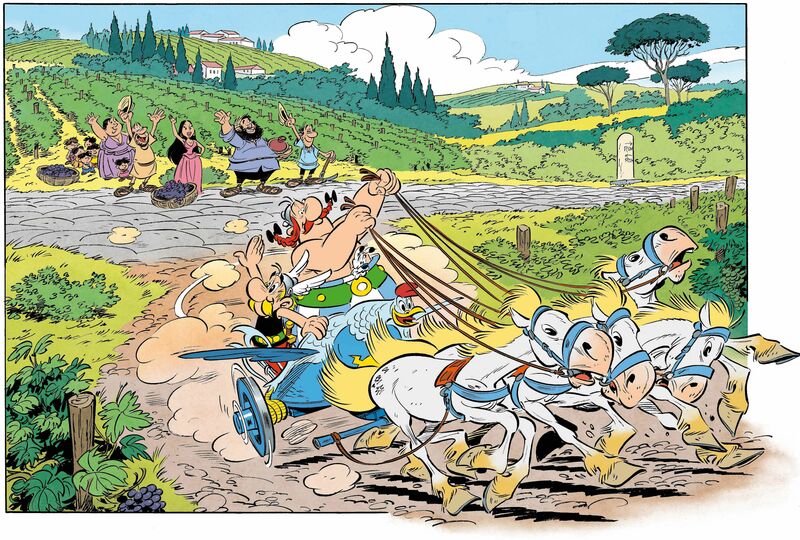 Can Asterix become as popular as Shikari Shambu or Suppandi among Indian comic book readers? DC: Indians being polyglots, read in multiple languages, and there is already a huge readership of Asterix in English in India, a country that has had a very strong tradition of comics not only in English and Hindi, but in several regional languages as well. 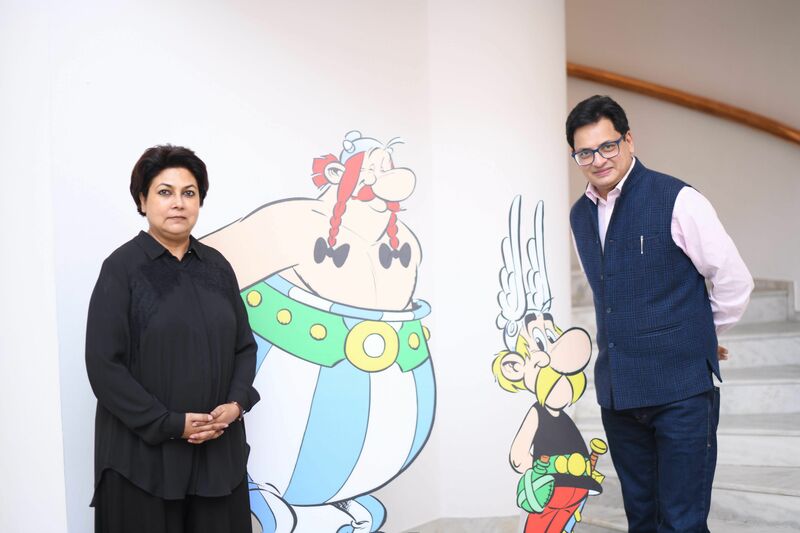 Asterix is Hindi is not only for strictly Hindi phone readers, but for comic buffs and collectors, artists, ethnographers and educational institutions, across linguistic boundaries, across India and the world. The first four ‘albums’ of Asterix in Hindi are priced `295 each, and available online and in major book stores.